Where can physics take you? Quite literally into space! 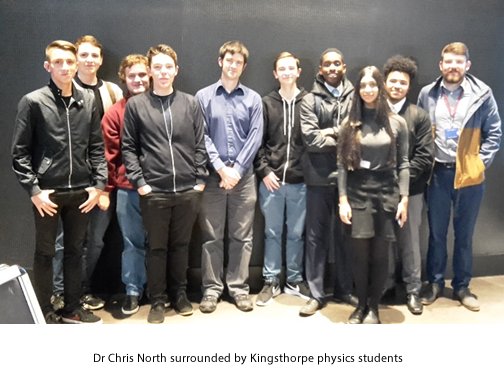 Year 12 physics students took part in the STEM (Science, Technology, Engineering and Maths) day in November at the National Space Centre in Leicester. We had a great day learning about careers in places as varied as Rolls Royce, the Met (weather) Office and the RAF. Did you know that most weather forecasters had physics degrees? There was also lots of information from the universities of Birmingham, Warwick and Leicester about some of the research they carried out and all of it linked to space exploration. The keynote speaker was Dr Chris North from Cardiff University. He spoke about the discovery of gravitational waves and the challenges of measuring a disturbance to Planet Earth less that one thousandth of a diameter of the atom’s nucleus across that’s just 0.000 000 000 000 000 001metres. The students were a credit to themselves and the college. If you want to know anything about high level physics, you know who to ask. Thanks too to Mr Campbell who accompanied us on the trip and looked after all.